What a great day to be running around Los Angeles. Today was our much anticipated 12 mile run (last week was cancelled due to poor air quality because of the fires). The morning started off very foggy, but once the sun burned off the mist, it was a PERFECT day to be outside. 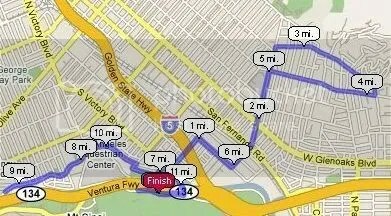 Our course took us out of Griffith Park and up towards the foothills of Glendale. This was a great opportunity for us to get some hill training so that we are prepared for the marathon(s). Once we came back down the hill, we ran back towards Griffith Park and then into Burbank. We even passed the famed Disney Studios. Then we came back to our starting point. I have no injuries to report. I must say that being a part of the AIDS Marathon program has been fantastic, especially the second time around. Each week I become stronger and more confident in my running. I can think back to last year during the 12 miler…I thought about the pain I had experienced. I couldn’t walk later on in the day of the run. Today, I was telling Ashu (my cousin who runs with me) after the run, that I could probably run another five miles. He looked at me like I’m a moron like he usually does, but that gave me my sense of accomplishment for the run. As described in the title of this post, I really do feel on top of the world. Today’s run was so empowering and I feel much stronger because of it. On a side note, a special note of thanks and congrats to Ashu for sticking it out and finishing the 12 miler. I know it was tough but we got through it. I’m glad you didn’t get mad at me when I pushed you through the pain. This week, I plan on two recovery runs and next Saturday will be a 6 mile short run. I look forward to that! Lastly, I am in need of fundraising support from everyone. I am required to raise at least $1,500 to complete this program…so far I am at a big fat ZERO! Please help me out…anything will help…you can give a donation as small as $5. It would mean the world to me. To donate, use the secure form by clicking here Thanks in advance!